It’s kind of weird to start a new year with the end of a storyline, but that’s just how things worked out this time! 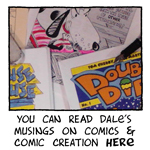 I hope your 2017 is off to a great start and that you’ll come back for more Watusi all year; I’m excited about the stories I have in mind for this talking dog, and I think you will be, too! Looks like there is some well-earned closure in store for Sir Watusi, too … even if Watusi can’t tell he’s there to receive it! I wish you all the best for a happy 2017, readers; thank you for following along on this storyline throughout the year. By the way, if you haven’t done it, there’s still time to take my reader survey and get a FREE downloadable copy of Festive Funnies before 2016 is over and done with. I plan to share the results early next year. …I mean it has to be a miracle if Watusi can be so generous to Mitchell, right? I hope everyone has a happy winter … and my sympathies to those of you who feel like you’ve been knee-deep in it already! There’s still time to take my reader survey and get a FREE download code for Festive Funnies; it features some rarely seen Watusi comics, and will be timely reading for the week ahead. As the year winds down, I’m taking a survey of my readers, and I would love it if you’d take a moment to answer some questions about my comic and your reading habits/interests. There’s a free .pdf comic in it for you if you do it before the end of 2016! The survey starts right here. Huzzah! A moment long in coming! Closer and closer! Hopefully the Professor can rescue talking Watusi before Sir Watusi gets gotten by the Vortextulizer! … even when, like this week, I have a lot on my plate. And that’s not some Thanksgiving pun, either– I’ve been busy finishing up my booth for the Memphis Arts Collective Holiday Market! I’m excited about this opportunity, and will be debuting new projects and showcasing all new paintings and drawings. Make a point to get to this show– it features over 30 artists and artisans from the Mid South showing and selling unique handcrafted items you won’t find anywhere else! It’ll be up from this Friday through Christmas Eve, so you’ll have lots of opportunity to shop local, support local artists, and have FUN! Watch my Twitter feed for announcements of when I’ll be at the market; it’s your chance to get comics signed or just chat with me about my art. Hope to see you there! Mitchell doesn’t look too happy at the return of Watusi … or maybe he’s just afraid the Professor’s conduit will bring Cthulhu across! A big thank you to everyone who stopped by my table during last weekend’s Air Capital Comiccon! If your first taste of Watusi has encouraged you to check out more, welcome! Feel free to browse the archives– a lot has happened since the “Emerald Serpent” storyline! I’m gearing up for my appearance this weekend at Wichita’s Air Capital Comiccon and I’ll be bringing my whole “Watusi and the Emerald Serpent” roadshow along with me. Hope to see you there!